When I tell people that we go to the Atlanta Botanical Gardens a lot I often get a confused smile or a glazed over look of boredom. It's not the Georgia Aquarium or the Atlanta Zoo. Therefore, it's not the place you would normally think of to get a membership and take your toddlers/preschoolers to. I am here to tell you that it is the place. It so is. 1) It's almost never crowded. The only time it's crowded is during the lights at Christmas. Even then it's awesome. My kids run and run and never get bored. And, they aren't being run over by older kids or massive school groups with one chaperone. Just sayin'. 2) The scenery and exhibits change and they are always amazing. My girls especially love Scarecrows in the Garden in the fall and the Garden Lights at Christmas. 3) They have story time! 4) They have a children's garden with a small playground/treehouse, small splash pad, and various other little details that my girls can't get enough of. 5) While the cafe there isn't cheap, it has delicious and incredibly healthy food. 6) They have members events that are often kid friendly. We have only done one of these, but it was more fun than even we expected. If you have little kids it's a must try at least once. I do think the children's garden is very geared towards littler children, but I have seen big kids enjoying it too. Yesterday we took the girls for the first time since Christmas. Usually we go a lot in the spring, but this spring was just busy. The newest exhibit was a hit to say the least. The pictures above are overcast (I am a terrible picture editor) because we braved yet another day of possible rain in Atlanta. Good choice on our part. We never even made it to the children's garden because they were so enamored by the larger than life plants in the current Imaginary Worlds event. If you go try it out let me know! We would love to join you. We took Everett to the light show at Christmas and thought he would love the lights. However, he was so enamored with the train garden, we spent several hours just watching the trains from every angle. He woke up the next morning asking to go see the trains again. 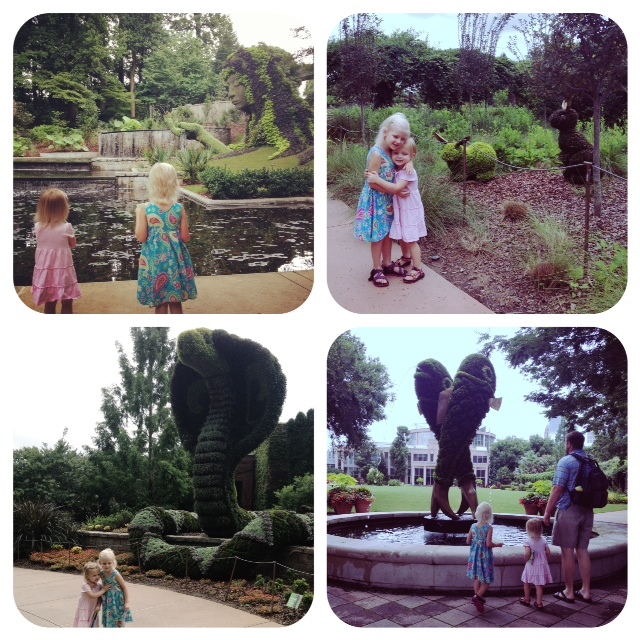 We find the botanical garden is a great place to take our grandchildren - plenty of space to run, not overly crowded, and always something new to see. My girls loved the trains too! They just followed them around and watched them go all over the place. Such a great addition to the lights for sure.